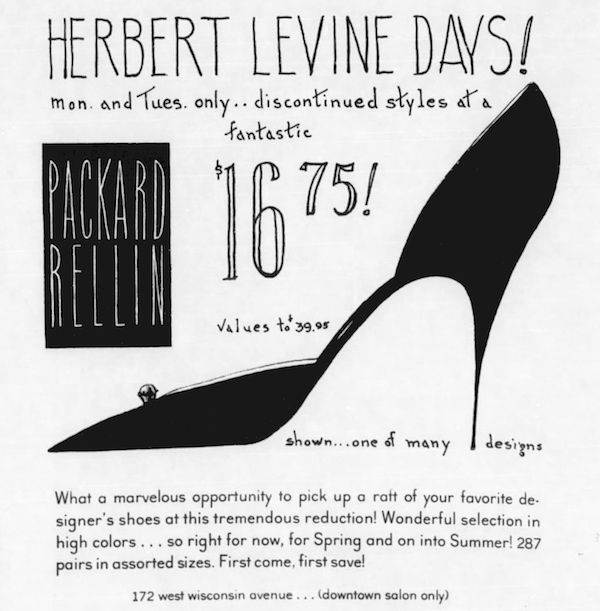 1960 | Herbert Levine Days! Beth Levine never stopped designing smart and elegant shoes but her brand soon became known for introducing the boot into elegant outfits. Eventually, her boot designs led Herbert Levine, Inc. to winning their first Coty Award in 1967 (1). 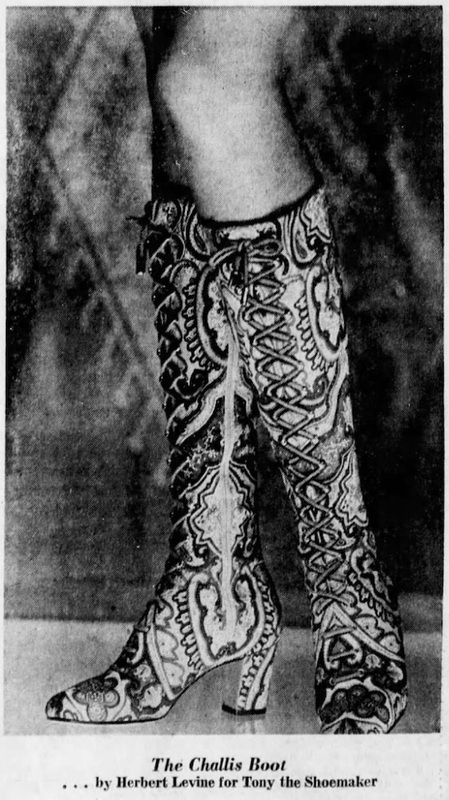 Everybody thought it was a big joke when Beth Levine designed a pair of white boots and wore them in 1953 when she made a whole collection of them. It was only a few years later that Courreges brought out his white boots in Paris, and you know the rest of the story. Boots have been so big that it was hard to believe the fashion can last another year. The husband and wife team of Beth and Herbert Levine know the right answer, though. What else can women wear when winter is cold and skirts are still short? Almost one third of their production this fall will be boots. The boot is interesting, not because of the fashion, but because of the feeling. The first time I did a high-heeled leather boot, I had this beautiful leather I could not stand to cut, so I made it into a seamless boot. It was comfortable, even though you had to pull the boot on. The last boots I made had the lightness of weight and the comfort of a nylon stocking. I believe that the boot in some form will always be in style because it is comfortable and a bad leg can look good in it. For the record, the Levines received another Coty Award (1973) - two years before they closed doors - the only shoemakers to be awarded twice. 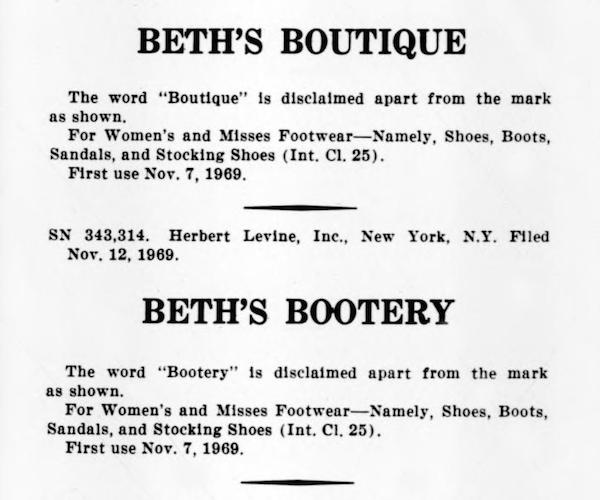 The boot business was so successful that Beth and Herbert created three new labels at the end of 1969: Beth Bootery, Beth Boutique and Lafitte. Forann, named after their daughter Ann (2); was established in 1965. IN BETH'S opinion, "Never before have boots been such an integral part of the entire costume as for this midi conscious season." One of originals, the laced boot, is getting enormous attention from fashion savants. 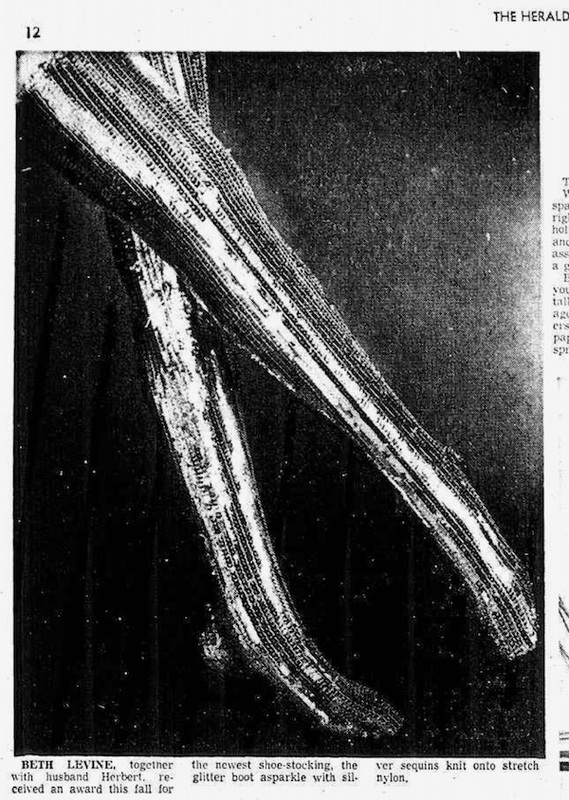 "Lacings reflect a definite nostalgia and also fit perfectly into the concept of softened clothes," Beth said. "It takes a little longer to dress, perhaps, but it is, in itself, an enjoyment of dressing." The Levines joined forces with all the major American designers of their time “to do shoes and boots for their collections. They are keenly aware that shoes come first - that without the right shoe a beautiful design effort can end in disaster. The designers worked with the Levine’s months ahead of their openings to assure the right shoe to complete their looks. They concur with Beth on the importance of working from the ground up. Add to the list Oscar De La Renta, Emilio Pucci, Halston, Bill Glass … Not that it is important, but feel free to find yourself a celebrity list of Herbert Levine enthusiasts as it is widely available everywhere. 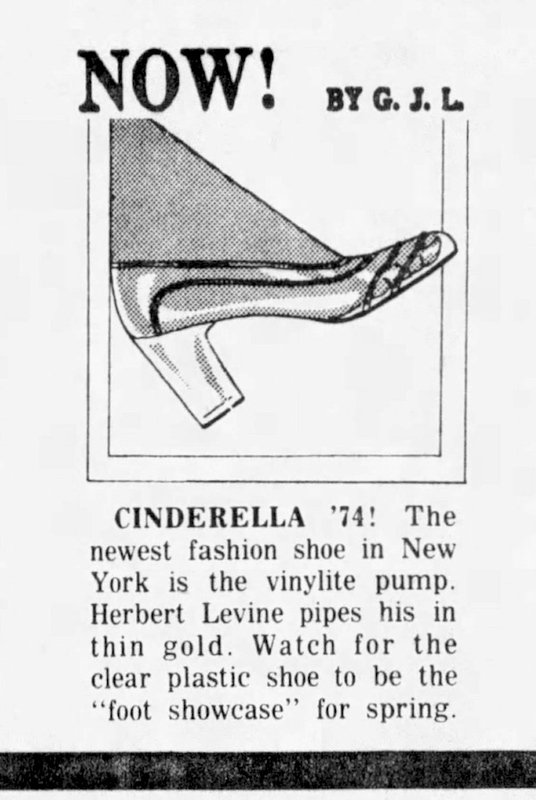 By 1975, the exorbitant price of making shoes in the United States along with the budding popularity of sneakers, led Herbert Levine, Inc. to stop production. Herb had had enough: he took care of his employees’ pensions and severance, and then he proceeded to shut the doors forever. Funny how the Schiaparelli reference is so contemporary. 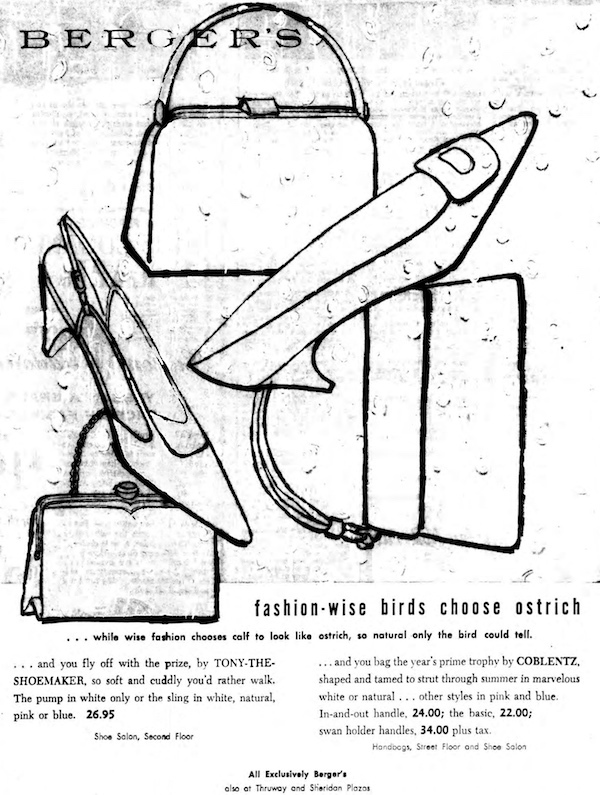 As soon as they closed production Beth and Herbert founded Betherb, Inc. and kept operating within the industry as consultants; an article from August 1976 - when their designs were showcased at the Metropolitan Museum of Arts - placed them working with producers of shoemaking machinery. 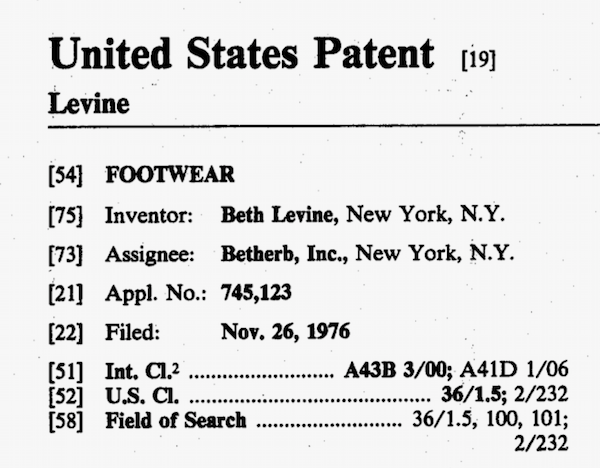 Betherb, Inc. also had a few patents under their belt. Herbert Levine died of lung cancer in 1991, while Beth passed away in 2006, aged 91, also of lung cancer. She was still involved in collaborations with well known designers. The brand Herbert Levine was briefly resurrected in 2008 by Dennis and Lynne Comeau (5), another husband & wife team, but it didn’t last and the label is now owned by an investment group whose Facebook page is dormant since May 2012. The Coty American Fashion Critics' Awards were created in 1942 by the cosmetics and perfume company Coty, Inc. to promote and celebrate American fashion. The City awards were discontinued in 1985. Helene Verin attributed the birth of Tony The Shoemaker at the end of 1969, but advertisements of the brand can be seen starting from October 1964; Forann closed its doors in March 1973. Dennis Comeau is a shoe designer who practised under the late Bandolino designer Enzo Angiolini. Along with his wife Lynne, he gave new life to historical brand Bernardo. Bought and sold in a few years, they tried the same with Herbert Levine with a less successful outcome. Side note: Dennis Comeau was actively involved at the beginning of the highly influential New York punk scene although details are fuzzy.